The rainbow pincushion makes for a fascinating floral display with flower buds opening bright yellow and slowly changing to flaming red. Leucospermum grandiflorum is an erect, lanky shrub growing 1.5-2.5 m tall. Leaves are grey and hairy and 50-80 mm long. The tips of the leaves have 3 glandular teeth. Flower buds have a hairy appearance and spinning top shape while tightly closed. The perianths (the pins of the pincushion) open in a spiral direction and are bright yellow with a pink pollen presenter on the tip. On maturing the perianth fades to orange and later red. Flowering occurs from July-December and seeds are released two months after flowering. Endangered! 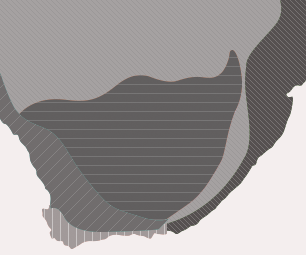 It is estimated that populations have decreased by more than 50% over the past 60 years. Fewer than five remaining locations with plants growing in the wild are known. These populations are not healthy as the habitat quality and number of mature plants is declining. Reasons for this include habitat loss due to agriculture, afforestation and invader alien plants, too frequent wild fires, and illegal wild flower harvesting. 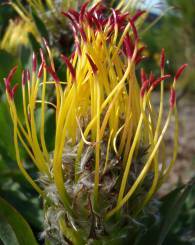 Leucospermum grandiflorum is a fynbos species and is endemic to Boland Granite Fynbos. This vegetation type is characterized by plains and hills with domed granite outcrops. Granite-derived soils are richer than sandstone soils and therefore have been rapidly transformed for agricultural use. In addition to this species being classified as endangered, the entire vegetation type is also classed as Endangered. Average rainfall figures are 985 mm per year with most rain falling in the winter months of May, June, July & August. In winter the temperature does occasionally (2-3 days annually) drop below freezing, with L. grandiflorum being able to tolerate very light frosts. In summer, hot, dry and often windy conditions are experienced with maximum temperatures reaching 27°C. On the mountain it grows in scattered stands on hot, dry slopes at an altitude of between 80 and 500 m. Its natural distribution is Paarl Mountain, Simonsberg, Paardeberg, Durbanville Hills and Berg River Valley. 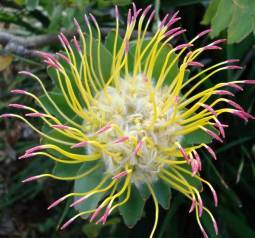 The name Leucospermum is derived from the Greek leukos, meaning white and sperma, meaning seed. The seeds are actually black but are coated with a white fleshy skin (elaiosome). Grandis- means big and -florum means with flowers. The Leucospermum genus contains about 48 species. Pincushions occur mainly in the winter rainfall fynbos region found in the Western Cape, but a few species do extend north to Zimbabwe. Fynbos is a fire-driven system which means the vegetation requires fire once every 10-15 years to regenerate and rejuvenate itself. Flowers are pollinated by the Cape sugarbird. After pollination, seeds are produced and released and fall to the ground. The seed has a white waxy coating; this is called an elaiosome and is a favourite food of indigenous ants. Ants disperse the seed by carrying it underground to their nests where they eat off the elaisome leaving the seed in safe storage, hidden away from predators like mice. Fire moves through the fynbos in late summer killing all the mother plants of L. grandiflorum. In early winter the rains begin and new seedlings germinate from the ants' nests where they were safely protected from the fire. Leucospermum grandiflorum has been used as a parent plant in many garden and cut flower hybrids are currently used in the trade. 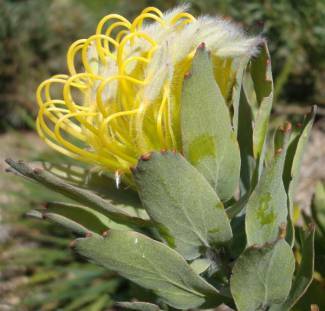 Leucospermum grandiflorum can be propagated from cuttings or seed but cuttings generally have a much higher success rate and are easier to obtain than seeds. Make cuttings from December to March (summer to autumn). The cuttings should be semi-hardwood, 60-100 mm long, and taken from the current season's growth. Dip the cuttings into a rooting hormone solution or hormone powder and plant into a medium of 50% polystyrene and 50% finely milled bark. Place in a growing house with bottom heat (25ºC) and intermittent mist. Once the roots are well developed, remove from the mist unit and harden off for three weeks. Plant the cuttings into small bags and grow on until ready to plant into the garden. Sow seed at the end of February when the days are warm and the nights start to cool down (late summer to autumn). Soak Leucospermum seed in smoke water to which hydrogen peroxide has been added, at the ratio of 1% of the total volume for 24 hours. This loosens the outer seed coat and oxygenates the seed. The softened seed coat is rubbed off. Dust the seed with a systemic fungicide. Sow on a well-drained medium consisting of 1 part loam, 1 part bark, and 2 parts sand, firm down and cover with a layer of sand or finely milled bark. Seed can be sown in an open seedbed, or in a seedtray placed in a sunny position. Germination begins after three to four weeks. Once two true leaves have grown, prick the seedlings out into small bags. The seedlings will have to be pricked out in batches, as the seeds germinate at different times. Place the seedlings in a lightly shaded area with good air circulation. When plants are ± 50-100 mm tall, or after one year's growth, they can be planted into the garden. Nipping out the tips of the seedlings will encourage branching and produce a neater shrub. The best time to place the young plants in the garden is just before the rainy season. This enables plants to establish themselves and send down deep roots before the hot, dry, summer season. 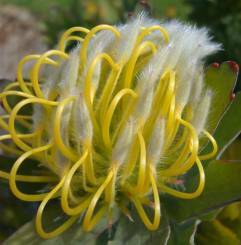 Leucospermum grandiflorum requires a sunny situation with well-drained soil. Add a scoop of well-decomposed compost at planting and water well for the first year. They do tend to get leggy and are best planted in a mixed fynbos bed amongst other lower vegetation that will hide straggly stems. Leucospermum grandiflorum can be temperamental in a garden situation and is prone to Phytophthora (root rot). Once proteas become diseased they are very difficult to treat, and it is better to prevent disease rather than try to cure it. Make sure the environmental conditions are correct. This includes getting direct sunlight for most of the day, a well-drained soil which does not stay saturated and will not stagnate, and good air circulation ensuring that the above-ground parts of the plant dry quickly after watering. It is also important to ensure that the soil stays cool in the hot months and that roots are not disturbed by digging. A thick layer of mulch or groundcover planting can be used to keep the soil cool and prevent moisture loss. If any of these factors are not correct, the plants become weakened and stressed, and you can be sure to attract some form of pest or disease. 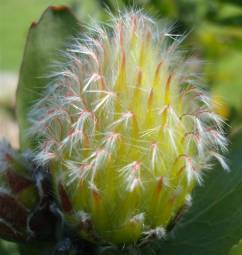 Pincushions in general are more tender to frost than other proteas and the uppermost branches, including flower buds, may burn and die back. Identify warmer, more protected spots in your garden to plant your pincushions. If your area experiences severe dry frosts, plants will need to be protected, especially while they are young. Cover plants with agricultural fleece, hessian or a cardboard box overnight, and uncover them in the day time. Once the shrubs have woody growth and are approximately three years old they should be hardy enough to survive without covering. Eliovson, S. 1979. Proteas for pleasure. Macmillan South Africa Publishers, Johannesburg. Mucina, L., Rutherford, M.C., (eds) 2006. The vegetation of South Africa, Lesotho and Swaziland. Strelitzia 19. South African National Biodiversity Institute, Pretoria. Rebelo, T. 2001. A field guide to the proteas of Southern Africa. Fernwood Press: Vlaeberg.